It's one of the finest feature films of our time. Better than Gone with the Wind. Better than The Godfather. And yes, even better than Star Trek II: The Wrath of Khan. Obviously, I'm talking about the fabulous head-turning hit of the century that wrecked cinema everywhere in the '70's and sent everyone everywhere in search of salvation. I'm talking about The Jerk. It's been a long time since I had last watched The Jerk. I'd say it was back when we had it on VHS and I was too young to know what the word "rubber" meant when used suggestively. I also didn't get a lot of the jokes. Watching it this time, so many years later, it still took me a second to get some jokes. However, I finally managed to remember why Steve Martin has long been a favorite comedy actor of mine. For a while I had forgotten. Much like his Bowfinger co-star Eddie Murphy, Martin just hasn't been rolling on all cylinders for a while. Unlike Murphy, Martin has some fantastic musicianship to keep himself in the public eye, but his comedy on film just hasn't been hitting those same notes. I don't know when it started, but I know that his take on The Pink Panther just made me cringe the first time I saw it and since then I haven't seen a single new Steve Martin film. Maybe that isn't fair of me considering that movie was released close to a decade ago and I only watched it once, but that is what did it for me. Maybe I'll watch it again soon. I probably should. Since then I've seen far worse movies and a little perspective couldn't hurt me. But The Jerk is one of those classics that I had been wanting to watch again for a long time now despite the fact that I haven't forgotten most of the gags. Much like Blazing Saddles or any of the Monty Python films, there are just so many quotes and they are so easy to remember and act out with drunk friends that sometimes the films themselves end up forgotten a bit. I loved the timing of this movie. Essentially, this movie really is a bunch of short gags stringed along a loose plot. A movie made such a way could easily get tiring, but so many of the jokes along the way are so sharp that the movie flies by. The character of Navin Johnson seems to change with each new gag, but Steve Martin plays the "straight man as an idiot role" to perfection that it doesn't matter much. Navin Johnson is what Steve Martin makes him. That's what makes this movie compulsively watchable. In this regard, he is a lot like Peter Sellers and Leslie Nielsen. He plays stupid so seriously that you almost think he thinks he isn't making a comedy but a drama. That's an incredible talent that a lot of people don't have. The "that's all I need" sketch is still hilarious because it just drags on and on and on. I'm certain Seth Macfarlane was influenced by this scene with the way some of the scenes in Family Guy drag on. Carl Reiner also deserves a lot of praise for this film since he not only directed it, but also had a role in it as a fictional version of himself that had been ruined by the Opti-Grab. I'm not sure how many takes he had to stay crosseyed for, but it was worth it. Of course, this film isn't for everyone. This isn't quite Blazing Saddles brilliance, but there is some racial humor not a lot of people will understand. The "I was born a poor black child" line should be a good indication, but the opening credits scene when the black family is singing a song and Navin is vainly trying to snap his fingers in rhythm is priceless. Later on he hears a "white person" song and begins to tap his toes and snap his fingers in rhythm and becomes ecstatic by it although his family can't seem to understand why he'd like such a song. This movie may not have been completely ahead of its time (since Blazing Saddles had come out a few years prior), but it still remains absolutely hilarious and a bit underrated. 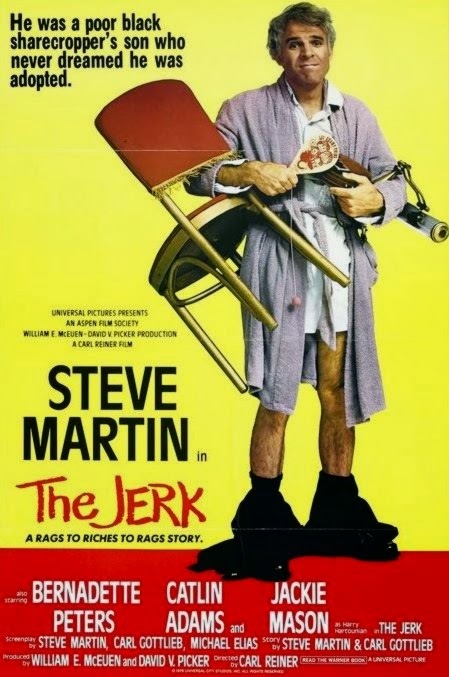 If you don't remember or know why Steve Martin was really funny then pick up The Jerk. There are certainly other movies that Steve Martin made that are good, but this is "the one" for me. "Special purpose, I've got one of those!" - "He hates those cans" - "The new phone books are here!" Steve Martin was a rock star stand-up comedian when this was made. He had comedy albums that sold ;like Zeppelin records. All of us high school kids loved him and he made numerous appearances on Saturday Night Live with the original cast (he was almost like a member of the cast because of how many iconic sketches he did on the show). I too, am disappointed with his output these past few years. He seems to have given up trying very hard and is content to make big bucks in watered down Disney type comedies. But, we still have a large amount of good stuff like The Jerk we can still watch over and over again and laugh no matter how many times we've seen it. The Man with Two Brains is one I've yet to see. I would like to add a comment about the impact The Jerk has had on my life. Every dog that I've had since this movie was released has had a regular name and a nickname, "Shithead." All of my dogs have responded to "Hey, Shithead."